You only need to read these instructions if you have our high resolution CCD option. See the detailed specifications with the manual for our advanced imaging camera. If you have the 1-CCD Laue camera, you need these instructions instead. If you have the 2-CCD Laue camera, you need these instructions instead. If you have the EMCCD camera, you need these instructions instead. 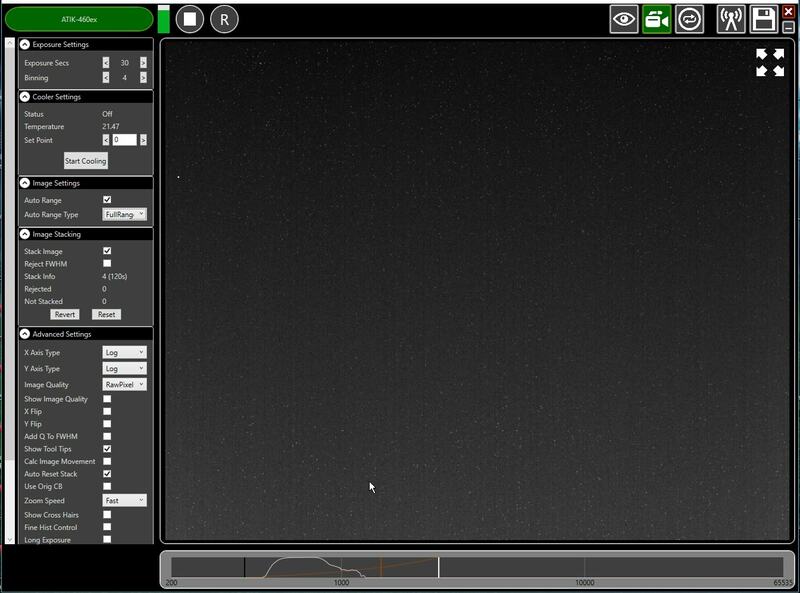 You can download the NeutronOptics software CD for the hires Atik camera here. NeutronOptics cameras can be supplied with various high resolution Peltier cooled CCD units with various camera dimensions This CCD unit is connected to a Windows computer via an amplified USB-2 cable up to 30m long. A typical hi-res cooled CCD is shown on a custom camera. To control this hi-res CCD, use either the native Artemis Capture application (which can be downloaded with the Atik core software), the ImageJ imaging environment, the LabView graphical instrument control environment, or the Artemis SDK using MS Visual Basic, C++. Download the Atik core software or use the NeutronOptics CD. Click the Windows "Start" button and open "Devices and Printers"
Double-click the "Unknown Device", select "Hardware", "Properties"
Launch ArtemisCapture to display the image and controls. The "File" menu is used to save the last image, the "Camera" menu connects the camera if it is not done automatically, and the "Colour" menu should be set to "Raw". The icons under the menus launch a single exposure or continuous loop exposures. The three remaining icons open the Exposure, Display and Cooler tabs. 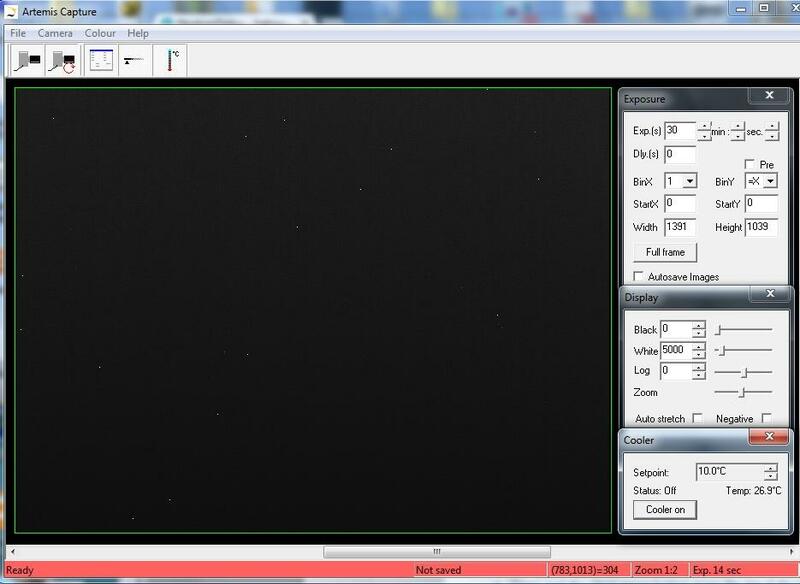 IMPORTANT: Zoom out to see the green outline of the full CCD. Click the image to enlarge it. The white dots are noise for a 30s un-cooled exposure. 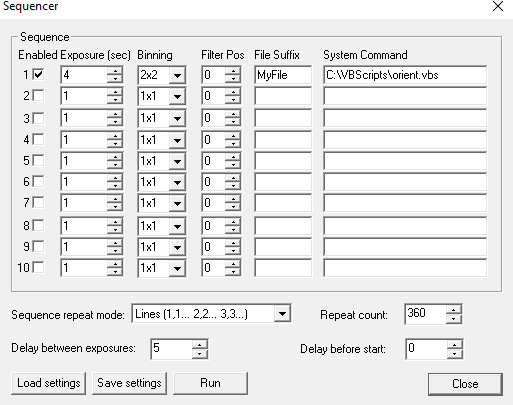 Typically you would set the exposure time and click "loop" with Display "Auto stretch" on. • Do NOT check the "Pre" box for imaging; longer exposures will show noise spots . • Check the "Auto stretch" option to select the best 8-bits out of the 16-bits. Note: scintillator afterglow may be seen for some minutes after exposure to light. • Set the temperature to -20oC to reduce noise when collecting neutron images. • If the CCD is cold, click "Warm up" and wait a few minutes before disconnecting. If the Artemis Capture window does not open, unplug/replug the power supply to reset. Focussing is with light, not neutrons. Place graph paper immediately in front of the scintillator, taking care not to dirty the scintillator surface. Slide the scintillator box onto the camera and open the lens door to allow light to enter. With the CCD near its closest position to the camera box, adjust focus for a small 500x500 pixel selected area, eventually with binning to speed up downloads. When focussing is complete, collect a "full frame" to check the FOV. Clamp the lens focus, remove the graph paper and seal the camera. With macro imaging you can obtain a smaller FOV by using the short front end. The minimum, focus distance of the 50mm lens is 500mm, but you can focus closer by increasing the distance between the lens and the CCD. You need an extra ~3mm to focus at 350mm, which can be obtained by simply unscrewing the CCD 4 turns and clamping it 3mm further from the camera box. (Otherwise you could use a "macro-ring" spacer immediately underneath the lens mount inside the camera). You can double the resolution (and halve the FOV) by replacing the 50mm lens by a 100mm lens. 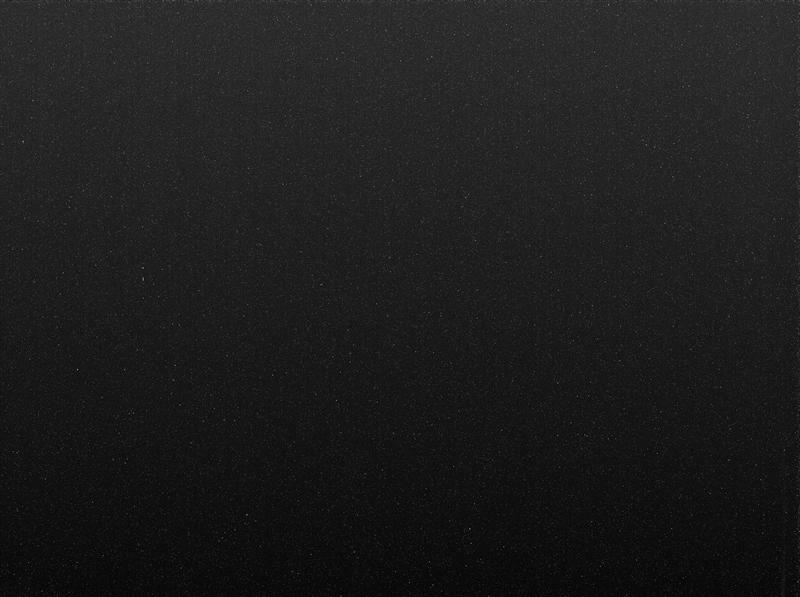 If the image is completely black, reduce the exposure to avoid saturation. Cooling becomes particularly important for very long exposures. The images above show a 300s exposure at ambient temperature (22C) (above left) compared to the same exposure after cooling to -6C (above right); only a few isolated hot pixels remain after cooling, and these can easily be removed with the ImageJ Despeckle filter. (Click images to enlarge). For high quality images, do NOT check the "Pre" box for fast readout, and do NOT bin. Both will emphasise and smear out hot pixels, and make them more difficult to filter. If you measure ONLY background, the display software will also emphasise hot pixels. Before you attempt to dis-assemble the camera or CCD unit, please email me ! Your camera includes a desiccant tablet, used to avoid condensation in the CCD chamber. This desiccant lasts a very long time but may eventually need recharging. 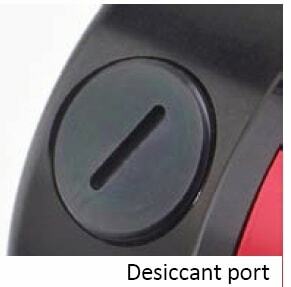 To replace the desiccant, open the desiccant port with the supplied plastic tool and a screwdriver and remove the tablet. Place it in an oven at 200ºC for 2 hours. Remove it and allow it to cool down. (CAUTION: it will be VERY hot). Place it back in the camera. DON'T over-tighten the port cover.  Wait 24 hours before connecting the camera. A filter inside the desiccant chamber avoids contamination when the chamber is opened. This filter is fragile and should not be touched. A complete ImageJ installation is included on the NeutronOptics software CD under "Extras". Copy the ImageJ folder to your C: disk & launch ImageJ to set defaults and update ImageJ. For tomography you can collect a series of images, calling a script to rotate the sample after each image by using camera/sequencer. In this example we take 360 2x2 binned exposures of 4s (with no filter), writing individual files to "MyFile?? ?.FITS" then executing script "orient.vbs" and waiting 5 seconds before starting the next exposure. You can substitute any type of script or application for "orient.vbs". See also ImageJ-for-ASCOM. Plink opens port COM4 and pipes commands such as 1PR0.5 to 1 Position Relative 0.5o. waiting 1s before killing Plink, which will be restarted after the next camera acquisition. All our cameras aquire images in 16-bit greyscale FITS format, from which ImageJ can create TIFF stacks of sequential projections. Applications such as MATLAB or OCTOPUS and free applications such as MuhRec, can be used for tomographic reconstruction of a stack of sections from a stack of projections. The ImageJ 3D Viewer can display stacks as texture-based volume renderings, surfaces or orthoslices. But first read one of the free on-line books such as Principles of Computerized Tomographic Imaging and The Scientist Digital Signal Processing. For Laue diffraction binning of 4x4 can be used to increase efficiency by a factor of x16 ! Try also the Infinity software, which allows you to see the image as it is built up by stacking shorter exposures. ImageJ for ASCOM is also suitable for tomography, Laue diffraction and very low-flux acquisitions. The acquired images are opened directly in ImageJ, and you can easily modify the interface by extending the ImageJ scripts. At the end of each image acquisition, a Windows routine Orient.vbs is launched (if it exists) to eventually re-orient the sample. You can simultaneously acquire images from dual-CCD Laue cameras and stitch them together. The camera can also be controlled using LabView, National Instruments' graphical programming environment for instrument control. You can download a free time-limited version if you want to control our camera together with other instruments. Excellent LabView on-line tutorials are available, as are a set of simple LabView (*.vi) files to control the high resolution camera. Note that you also need the LabView Vision Developement Module, and you can download a free evaluation version. We cannot provide support for LabView, for which you must rely on National Instruments or the NI user group, which has posted example files for Artemis cameras. One of our clients used a simple LabView application to control his sample turntable, and then used the ArtemisCapture/sequencer to call that Labview routine after each image acquisition. The Artemis SDK Software Developement Kit contains C++ support and example files to allow you to develope your own camera acquisition code. You can also use the PHD application for simple real-time image capture with the Hi-res camera (without cooling), or the Nebulosity3 application, with either the Atik/Artemis driver or the ASCOM driver. These applications are also available for macintosh systems. Double-click the top bar to expand/contract the window. Set the exposure time and binning (to 30s and x4 for the Laue camera). In the "Image Stacking" dialogue that appears on the left Uncheck "Reject FWHM"
Check "Auto Range" in the "Image Settings" and eg "FullRangeMinus"
Noise is evident because we didn't cool. Set Temperature to 5C in "Cooler Settings"
Slightly different manuals are available for our high resolution CCDs our hot neutron camera our "fast" high resolution camera. our 1CCD Laue camera and our advanced imaging camera.